Don’t get me wrong I am interested in it, just not as much as discovering new colors. I like to know so I can see how the color trickles down from high fashion to regular day culture. And I do like this color. Its a nice brown red wine colour, which is neutral and natural but also rich. I am partial to red shades already, but excited how it will come about. I found 2 colours in my collection that are in the same hue range as Marsala. 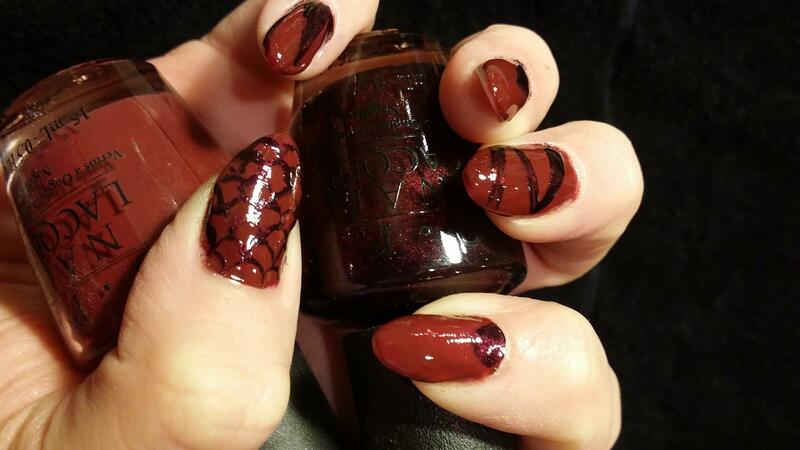 OPI’s “Magala Wine” and a shimmer discontinued “Miss Behave”. Also tried some simpler nail art on the nails. What do you think of this color? Do you have this in your closet already?